San Francisco - A federal district court judge in San Francisco has ruled that National Security Letter (NSL) provisions in federal law violate the Constitution. The decision came in a lawsuit challenging a NSL on behalf of an unnamed telecommunications company represented by the Electronic Frontier Foundation (EFF). In the ruling publicly released today, Judge Susan Illston ordered that the Federal Bureau of Investigation (FBI) stop issuing NSLs and cease enforcing the gag provision in this or any other case. The landmark ruling is stayed for 90 days to allow the government to appeal. "We are very pleased that the court recognized the fatal constitutional shortcomings of the NSL statute," said EFF Senior Staff Attorney Matt Zimmerman. "The government's gags have truncated the public debate on these controversial surveillance tools. Our client looks forward to the day when it can publicly discuss its experience." EFF's NSL legal team. 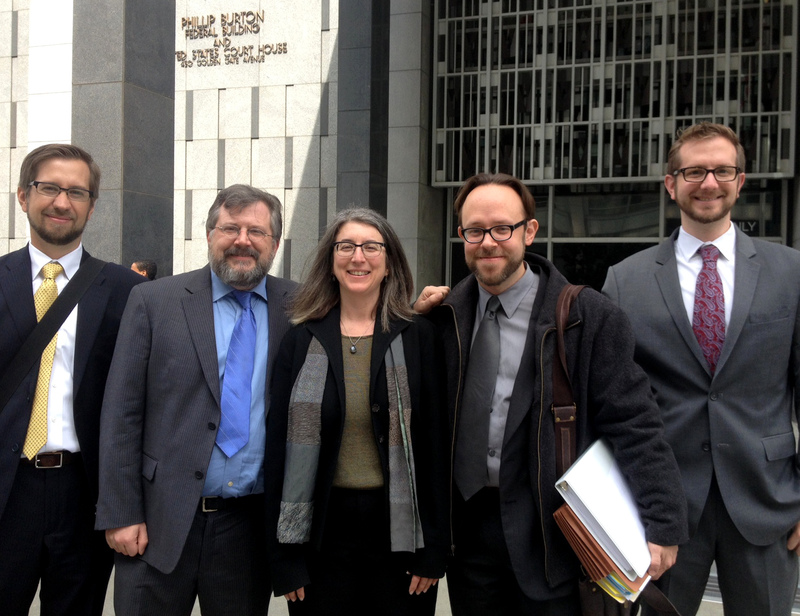 From left: Mark Rumold, Kurt Opsahl, Cindy Cohn, Matt Zimmerman and Nate Cardozo. The controversial NSL provisions EFF challenged on behalf of the unnamed client allow the FBI to issue administrative letters -- on its own authority and without court approval -- to telecommunications companies demanding information about their customers. The controversial provisions also permit the FBI to permanently gag service providers from revealing anything about the NSLs, including the fact that a demand was made, which prevents providers from notifying either their customers or the public. The limited judicial review provisions essentially write the courts out of the process. In today's ruling, the court held that the gag order provisions of the statute violate the First Amendment and that the review procedures violate separation of powers. Because those provisions were not separable from the rest of the statute, the court declared the entire statute unconstitutional. In addressing the concerns of the service provider, the court noted: "Petitioner was adamant about its desire to speak publicly about the fact that it received the NSL at issue to further inform the ongoing public debate." "The First Amendment prevents the government from silencing people and stopping them from criticizing its use of executive surveillance power," said EFF Legal Director Cindy Cohn. "The NSL statute has long been a concern of many Americans, and this small step should help restore balance between liberty and security." EFF first brought this challenge on behalf of its client in May of 2011.